The Heart of the Antarctic being the story of the British Antarctic Expedition 1907-1909 by E.H. Shackleton... with an introduction by Hugh Robert Mill... an account of the first journey to the Magnetic South Pole by Professor T.W. Edgeworth David. London: Ballantyne & Co. Limited for William Heinemann, 1909. 3 volumes (including the supplement The Antarctic Book Winter Quarters), 4° (265 x 223mm). Half-titles. Titles (to vols.I & II) in brown and black. Plates (a few double-page, some mounted including 16 coloured after George Marston, some etched), 1 folding panorama and 3 folding lithographic maps printed in three colours in pocket at back of vol.II, illustrations. Original vellum (vols.I & II) and vellum-backed boards (supplement), covers of vols.I & II blocked in gilt with the two penguins device, spines of all three volumes lettered in gilt, t.e.g. 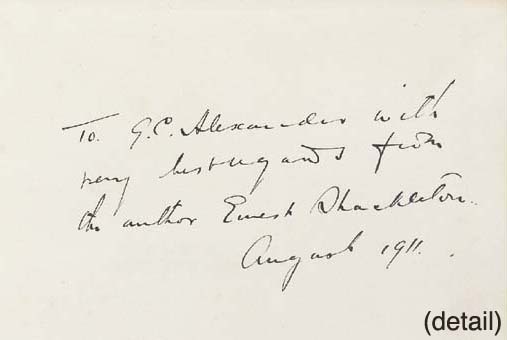 Provenance: Sir Ernest Henry Shackleton (1874-1922, presentation inscription 'To G.C.Alexander with/very best regards from/the author Ernest Shackleton./August 1911'); G.C.Alexander (inscription). If I said that any chapter was simply my transcription of notes taken down from Shackleton's dictation, I should be telling an untruth [Saunders explained later]. If I said that any chapter was entirely mine, I should be telling an untruth. My work was complementary to his. I could say that Shackleton had a remarkable gift of literary suggestion... and that when his interest was stirred at critical portions of his narrative, he had a command of vivid forceful English. Shackleton and I understood each other thoroughly. As a result, The Heart of the Antarctic... bore none of the tell-tale stiltedness of most ghosted work. The book appeared early in November, an unprecedentedly quick five months after putting pen to paper... Shackleton wanted Saunders' name on the title page, but Saunders refused. The book, as he afterwards said, "should stand without any attempt being made to explain just how [it was] produced"' (R. Huntford, Shackleton, London, 1996, pp.317-319).